Coding feels like you are paddling in six-inch stilettos for your dear blog's life. Coding is without a doubt difficult and completely overwhelming. This is especially true if you are on Blogger. Blogger is extremely frustrating for the creative artist in me. Blogger has yet to allow users to fully customize features with a design conscious look. As a result, Blogger users are very limited in final blog design without learning how to code. Then, I will end the post by giving you one of my personal designs. Make sure you continue to check in with my blog because I will post new blog styling content every week! I prefer a whimsical and minimalistic look. You will see my style reflected in all of my graphic designs. Please take a gander around my website to see if it is the style you are looking for. 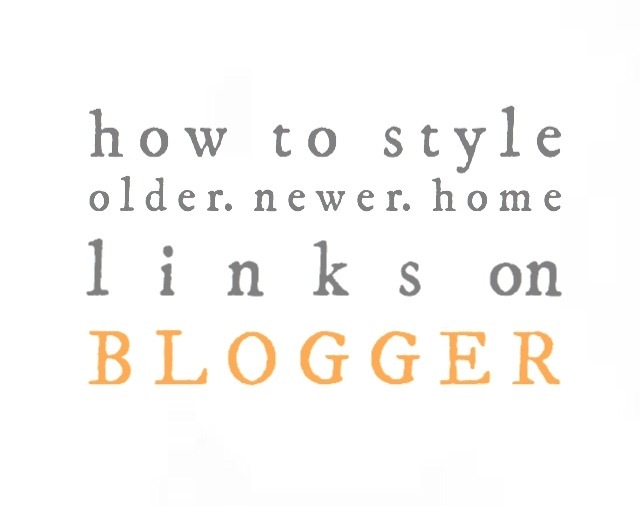 If yes, my blog makeover tutorials are made just for you! PART 1: I will teach you how to customize your older, newer & home links with your own graphic designs. If you want to use my content design instead of creating your own, scroll down to PART 2. PART 2: This following part of the tutorial will guide you in transforming your older, newer & home links into the above design. Now, I definitely feel like your Fairy Blogmother.